Great Horned Owls are referred to as “the tiger of the sky” because of their keen hunting skills and their ability to capture a wide variety of prey sometimes larger or heavier than the owls themselves. 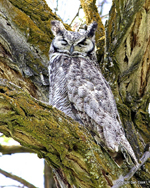 The Great-horned Owl is one of the few species that preys on skunks on regular basis. In humid habitats, these owls' plumage tends to be darker brown, whereas in more arid areas these owls may be lighter in color. This is a typical plumage color trend in many animals. The Great-horned Owl is the most widely distributed true owl in the Americas. It can found living in the tundra of North America all the way south to Tierra del Fuego, the southern tip of South America. It is absent from a few notable areas throughout the Americas, however, including the Amazon Basin. This owl's adaptability and wide prey base allows it to survive and thrive in just about any type of habitat. 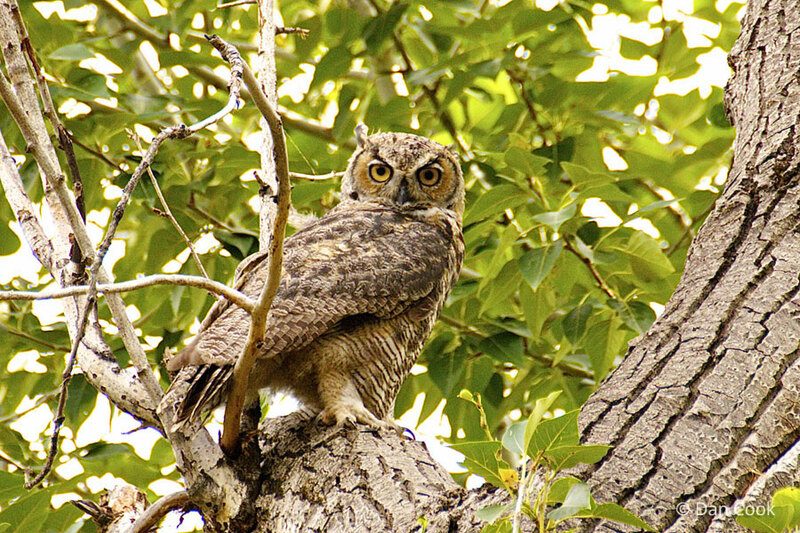 From deserts to deciduous forests, from pampas to praries, from tundra to tropical rainforest, and from mangroves to mountains, the Great-horned Owl can be found in all but the most extreme environments. It is even adapted to living in urban areas and can sometimes be found in city parks or campgrounds. It tends to hunt in areas that are more open, while it roosts and nests in more forested habitats. This large owl is mottled with a multitude of colors from grey to black and brown to beige and white. It has bright yellow eyes and feathery ear tufts, which give it its name. 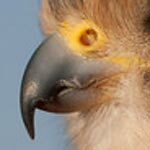 It has large powerful feathered feet which it uses to take down prey often times much larger than itself. 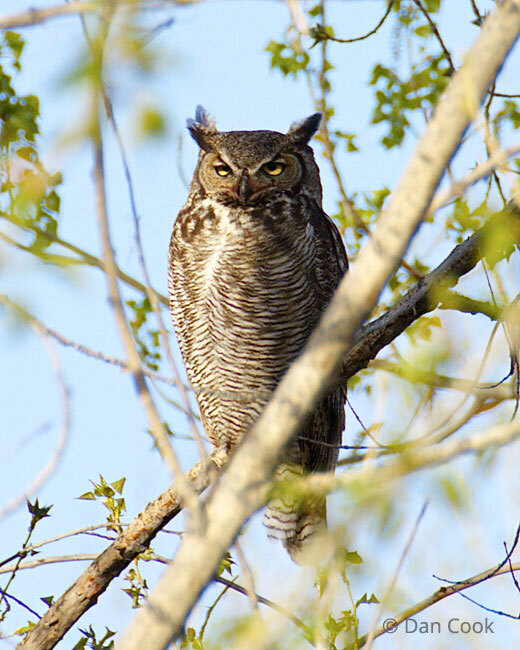 The adult Great-horned Owl can be quite vocal, with a deep, but loud "hoo-hoo-hoo hoo hoo." The young in the nest can also be quite loud, making screeching and hissing noises comparable to those of the Barn Owl. Like many raptors, these owls are top predators – they hunt other animals for food but no animals hunt them on a regular basis. For most top predators, their only threat is humans. Top predators, such as the Great-horned Owl, play an important role in nature by helping to control populations of prey animals and maintain a balance in the ecosystems where they live. The Great-horned Ow is mostly nocturnal, or active at night. It spends its days roosting, or resting, in a safe perch. The Great-horned Owl is not a threatened species. Its adaptability to various habitats and its varied diet give it a survival advantage. However, that doesn't mean that individual owls don't fall in harms way. Young Great-horned Owls may fall prey to predators such as foxes, coyotes, or when very young, potentially other raptors or even crows. 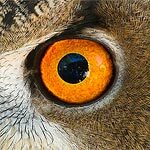 Though they are protected by law in most countries, Great-horned Owls are still occasionally shot or poisoned by humans and many die from collisions with vehicles, buildings, barbed wire fences, windows and power lines. The Great-horned Owl is an incredibly successful hunter. Known to take just about any small to medium-sized animals, what follows is just a partial list of what is on a Great-horned Owl's menu: rodents, skunks,moles, squirrels, porcupines, opposums, marmots, herons, loons, swans, ducks, gulls, passerines and even other raptors such as Red-tailed Hawks, Aplomado Falcons and even other owls, young alligators, frogs, toads, salamanders, snakes, centipedes, catfish, eels, worms, scorpions, crayfish and even carrion if other food is scarce. They hunt at dusk and during the night from a perch, while flying low over the ground, walking on the ground, or even wading into water to get at their prey. They are silent hunters that use their keen eyesight and hearing to locate and capture prey. Like other owls, and some other raptors, Great-horned Owls are equipped with a facial disk, a group of feathers around their heads that helps direct sound to their ears. To get an idea of how it works, cup your hands behind your ears and listen – sounds will be louder and clearer. Owls can raise these feathers slightly when on the hunt, allowing them to hear the rustle of a mouse in the grass, the flapping of feathers in the night, or the slithering of a snake in a tree branch. These sounds give away the location of prey animals, making it easy for these owls to deftly swoop in to catch a meal. Great-horned Owls, like many other owl species, will swallow smaller prey items such as rats, whole! For larger prey, of course, they must use their sharp beaks to tear off bite-sized chunks of meat. When an owl does swallow its prey whole - it swallows everything - bones,teeth, tails and claws, and fur and feathers. As you can imagine, some of these items might be difficult to digest - even for an owl. All those undigestable bits are regurgitated in the form of a pellet. The pellet is oblong in shape and usually covered with the undigested fur or feathers. Inside, bones, teeth and nails can be found. In fact, in some owl pellets scientists (and students, too) have been able to find the entire skeleton of the owl's prey! When courting season begins, the male owl tries to attract a female with his call. The male and female can often be heard dueting back and forth with each other at dusk. 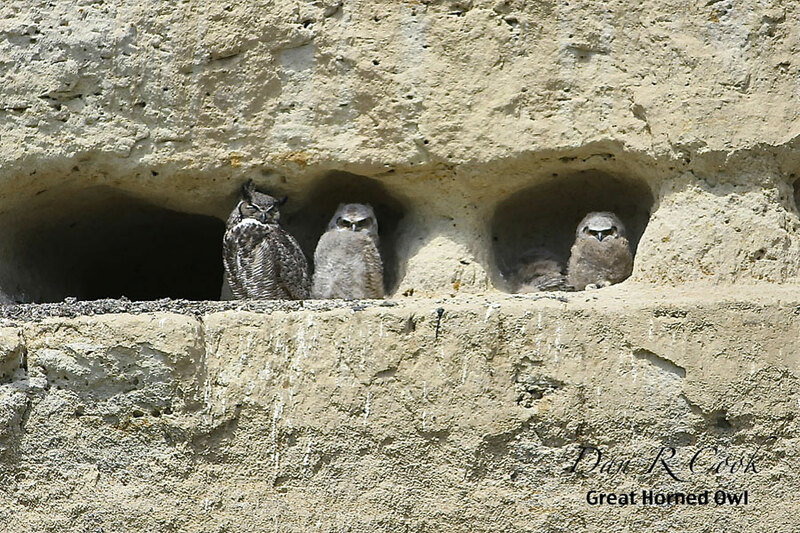 Like other owls, Great-horned Owls don't build their own nests, but use the abandoned nests of other large birds such as ravens or Red-tailed Hawks. They may also nest in tree cavities, on the ground, on platforms, rocky outcroppings, cliff ledges, artificial nests or tree snags. The female will usually lay between one to four eggs, though as many as six have been reported, though this is quite rare. The female is responsible for incubating the eggs and will spend the better part of a month sitting on the nest. Specifically, incubation lasts from between 28-35 days. At this time, the male is the one responsible for bringing her food. After the chicks hatch, the male will continue to provide food for them and his mate. 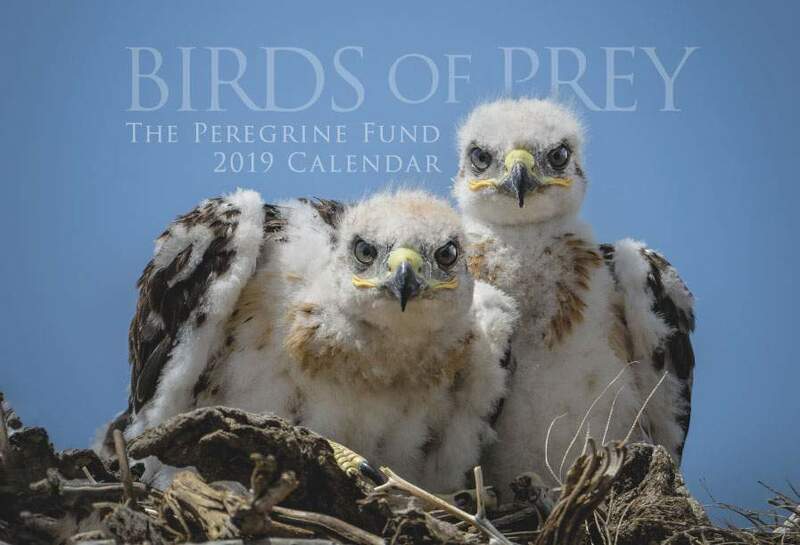 When the young are about six weeks old they will begin to leave the nest and practice flapping and exercising their wings - often making short flights or hops around nearby branches. At this time, they are still covered with a lot of down feathers. They will need another 4-6 weeks until their feathers grow in and they are able to fly well. Little by little they will begin to make longer and further flights until they become adept fliers. During this transition period, these young Great-horned Owls are very vulnerable to predation, particularly if they are spending a lot of their time very low in a tree or on the ground. The young may stay in their parents' territory for 6 months while they learn how to become skilled and successful hunters. After leaving dispersing from their natal area, the young may may spend a year or two "floating" before they find a territory and a mate of their own. 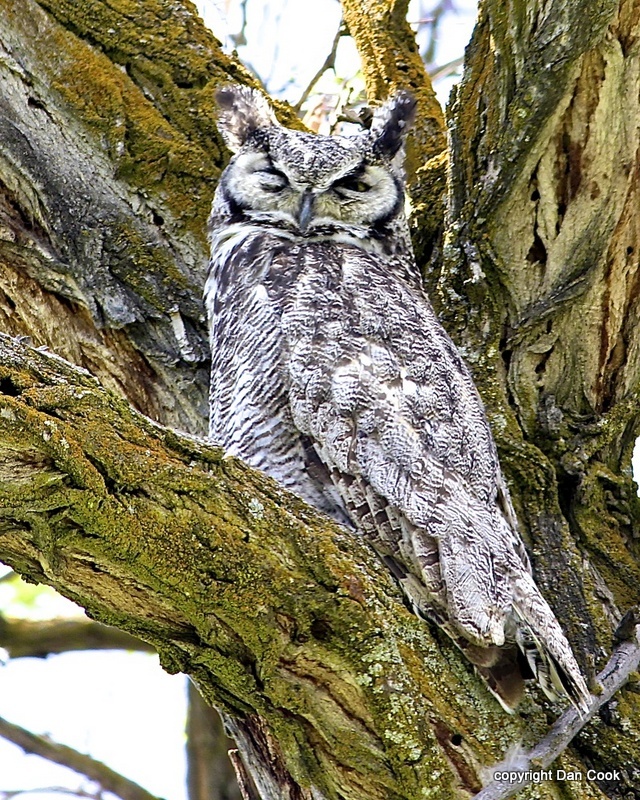 The Great-horned Owl population in Idaho is alive and well. They are found throughout the state, except in areas of very high elevation. They can often be seen and heard along the Boise Greenbelt, only a short drive from The Peregrine Fund's World Center for Birds of Prey. Listen for them, or try to spot a roosting owl high up in a tree. Though rare, Great-horned Owls are sometimes seen perched in trees around the World Center for Birds of Prey visitor center and the main office building. Be sure to keep an eye out for them when you visit. If one doesn't appear on the day you visit, not to worry. The visitor center at our World Center for Birds of Prey includes owls among its avian ambassadors, including a Eurasian Eagle Owl. This is a great chance to see owls up close and learn about the wonderful and interesting adaptations they have in order to survive in their respective habitats. There is also a touch table with owl feathers and other natural objects available for exploration.